THE NUTLEY SUN (April 23, 1943) -- Mrs. Hilda Malmstrom, a war bride, was notified by the War Department Wednesday morning that her husband Staff Sgt. 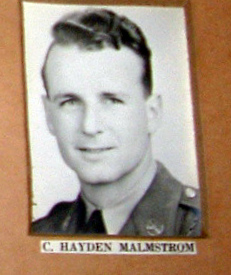 Carlyle Hayden Malmstrom had been killed in action in North Africa on April 6. The Malmstroms were married in July 1941, at Florence, S.C.
Carlyle, or Hayden, as his friends knew him, was last heard from on March 19 when he wrote that "it's just as safe here as at home." His letter was dated March 5. His parents, Mr. and Mrs. C. P. Malmstrom, of Cathedral avenue, are of the opinion he was killed in reconnaissance work. He had been attached to a reconnaissance unit, which scouted enemy positions and was usually stationed many miles in advance of the frontline American troops. He had received extensive commando training and was known as an "ace utility man." Sgt. Malmstrom was awarded the Purple Heart medal posthumously for gallantry in action. He was also awarded the European-African-Middle Eastern Campaign Medal; WWII Victory Medal; Honorable Service Lapel Button WWII. Staff Sgt. Malmstrom, Nutley's 10th war casualty had been commended for his actions assisting division commander during maneuvers on Aug. 21, 1941. It read, in part, "He promptly realized the situation, assisted in locating and assembling reserves and furnished transportation to his Division Commander at a critical point." Calvary Commander Capt. W. F. Damon, Jr., his commanding officer, stated "It is with the greatest of pleasure that I able to forward you official recognition of your qualifications as a soldier. I consider your action not only to be a reflection upon yourself, but also upon the troop of which you are a part." Malmstrom had been selected for officers' training, but he order was rescinded because of imminent overseas duty. Although his letters from the training camps in the United States were replete with details of his experiences, his North African letters were very brief and vague owing to strict censorship regulations. He appeared to be considerably impressed by the dazzling white buildings and the magnificent Arab and French palaces in the Tunisian area. The sergeant was inducted into the Army on Jan. 20, 1940. During the greater part of his stay in the U.S., he was stationed in Fort Bragg, N.C. His wife joined him there after their marriage and remained for six months, at which time Carlisle was called north for special commando training. Since then, Mrs. Malmstrom has been living with her husband's parents. A Nutley girl, she is the former Miss Hilda Fillipone. Carlyle was born in Boston, but later came to Nutley with his parents. He was educated in Nutley schools and went to work at Hoffman-LaRoche following his graduation from high school. Plans had been made to send him to Oberlin College, but he fell in love when he met Hilda, who also worked at Hoffman-LaRoche, and he decided to stay in Nutley. 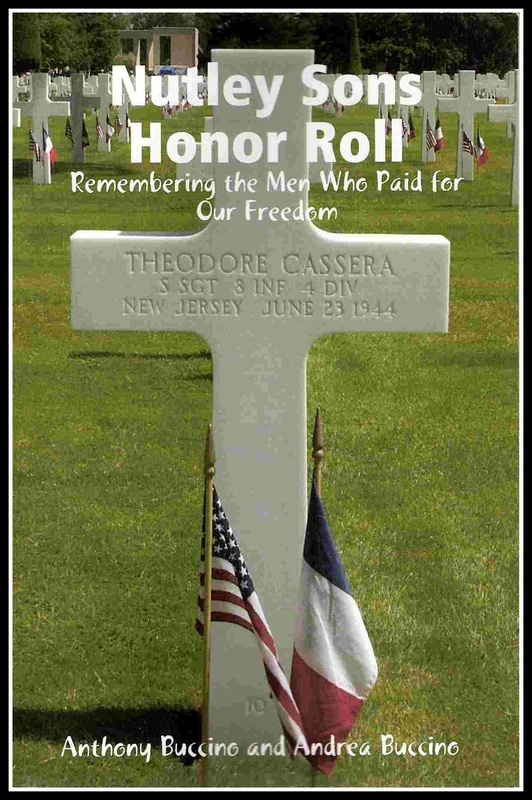 He was a member of the Rutherford Elks, which is his father's lodge. He was very fond of the violin and as a boy was a member of the Mickey Mouse orchestra which had a concert every Saturday at the Franklin Theater. Although he recently spoke of going on a farm and raising chickens, his major interest was in business. He attended Rutgers University for two years, where he studied business administration. The Malmstroms have another son, George, 17, who is a student at Clifton High school. Memorial services will be conducted by the Rev. Fred E. Miles, Tuesday evening at 8 o'clock in the Vincent Methodist church.